How long has Essex been hosting the Show? 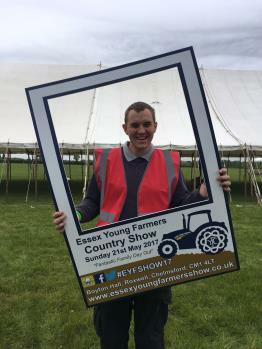 The Essex Young Farmers Country Show has been running in its current form since the mid ‘80s. The then ‘Show and Rally’ grew quickly through the ‘90s, with the demise of the Essex Show. How many people get involved in organising it and are they all YFC members? There is a committee of approximately 40 people who are made up of active members with the exception of our amazing staff, Mary and Carol. Does the Show make Essex FYFC money? It does. It’s a considerable sum, which looks after the county Federation. We have two buildings to look after, two staff to pay and it puts a significant amount into the Essex FYFC training fund every year for the members to use to further their careers. How many people does it generally attract? It's still growing slowly but last year we broke the 15,000 mark for the first time. Wow. Everything. We have so many different areas. The Game Fair, Craft Hall, Festival of Food, the Livestock Area, ‘What is YFC?’ Area and the Young Farmers Exhibition Hall. Of course not forgetting over 100 trade stands too! Do you have sponsors? How did you go about getting them? Many of our sponsors are historic supporters of Essex FYFC. Our local agricultural dealers look after us incredibly well, donating all the machinery for running the show. This includes several telehanders, a handful of UTVs, trucks, trailers and much more. Our advice on attracting sponsors is you can't beat face-to-face meetings with them. After all, the show would not happen without them. What top three tips can you share with other YFCs to help them grow their shows? 1. Start small and build up. 2. Ensure quality not quantity. 3. Find a good location with good infrastructure and road networks and stay there! The Essex Country Show is on Sunday 21 May at Boyton Hall, Roxwell, CM1 4LT. Gates open at 9.30am.